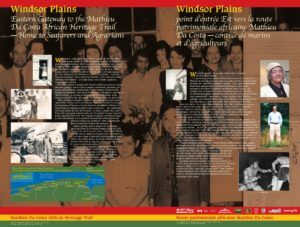 Beginning in Annapolis Royal in the west and spanning to just outside Windsor in the east, the Mathieu Da Costa African Heritage Trail documents the African Nova Scotian experience as it has unfolded throughout Western Nova Scotia for over 400 years. 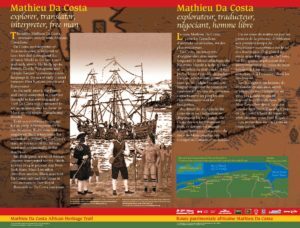 True to its’ namesake, the Mathieu Da Costa African Heritage Trail invites visitors to explore our rich African heritage through a series of bilingual interpretive panels. Each stop on the trail is a celebration of Nova Scotian African culture and history that has been cultivated by unique individuals and strong communities that are too often forgotten. This adventure into history includes recognition of the lives and achievements of Rose Fortune – Canada’s first female police officer, Ben Jackson – a loyalist who, after building a life in Nova Scotia returned to the United States and fought with the Union during the Civil War and W.P. Oliver – the nationally recognized , educator orator and spiritual leader. Black’ history in the province isn’t only about outstanding individuals the trail also features the communities of Inglewood, Gibson Woods, Windsor Plains and also the recognition of the African United Baptist Association (AUBA) which serves as a spiritual bond for many community members found throughout region. Experience the legacy in this unique journey. POSTERS NOW AVAILABLE– To order individual reproductions or complete sets contact the VANSDA office for pricing and shipping information. Mathieu Da Costa is becoming known to an ever-widening number of North Americans as the first identifiable person of African descent to appear in the earliest records of contacts between First Nations people and those from across the Atlantic. Da Costa, an interpreter who likely spoke French, Dutch, Portuguese, and “pidgin Basque”, is believed to have traveled throughout the Atlantic World in the late 1500’s and early 1600’s. 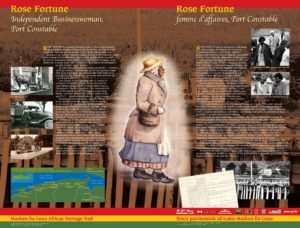 An intriguing figure in Nova Scotian history, Rose Fortune was an independent businesswoman of African descent, she demonstrated remarkable character and indomitable resolve in her varied enterprises. This panel provides a unique window into the life of this extraordinary woman.An impressive person, very authoritative, and clearly a dynamic figure, Rose Fortune lived a full life in Annapolis Royal. She greeted passengers coming ashore and transported their luggage to their destination. Through her indomitable resolve, she managed to keep order on the Annapolis wharf, and became the town’s one-person Police Department. While enjoying the panel, navigators of the Mathieu Da Costa Heritage Trail are treated to a spectacular view of the Annapolis River. The Mathieu Da Costa African Heritage Trail celebrates the lives of remarkable individuals but also our strong communities. 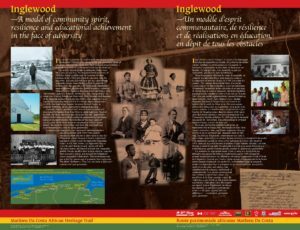 Inglewood Community is one with historic provincial importance. With its emphasis placed on education, this community has supported its members with unwavering commitment. Steeped in history, Inglewood’s segregated school became the Inglenook Community Centre. Parents instilled pride in their children, expected them to excel in school, and ensured the Bridgetown school responded to their needs. This involvement was key to the high percentage of graduates from Inglewood. The elders’ sentiment– “You, too, can make a difference” still resonates for each generation. 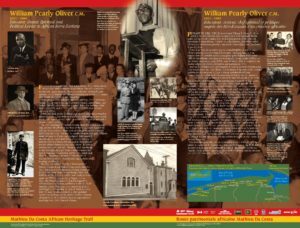 For over half a century Reverend Dr. W. P. Oliver served Nova Scotia with compassion and vision. One of our greatest leaders, his legacy endures. A first-class educator, African Baptist Minister and social thinker, Dr. Oliver’s contributions to church, community, family and province are unmatched. 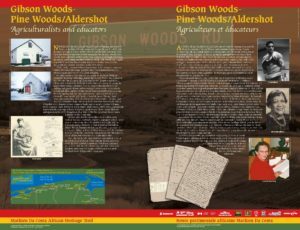 Nestled in the Annapolis Valley, west of Canning and north of Kentville, is Gibson Woods, named for George Gibson who is believed to have purchased forty acres of land for forty pounds in 1804. Upon his death his land was divided among his five children. Nearby Pine Woods (now Aldershot) settled earlier, was home to Black families bearing the names Jones, Beare, Landsey (Lanzey), Smith, Bell, Powell and Higgins. One well known Pine Woods settler was farmer Elisha Lawrence who, along with wife Amelia, was listed in the 1871 Census. Today, some Black families in greater King’s County can trace their heritage to ancestors once enslaved by early Europeans, Loyalists, and New England planters. Those who were Free Black Loyalists and War of 1812 Black Refugees were given the opportunity to purchase forty acres of land for forty pounds in and around the community. 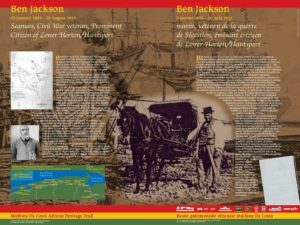 Civil War veteran, agrarian, entrepreneur, and prominent citizen of Hantsport, Ben Jackson demonstrated a level of personal character and integrity through valour, and commitment to his community. Jackson served on the USS Potomac (88-gun ship of the line) and USS North Carolina, then as Captain of Gun #10 aboard the Sloop-o’-War USS Richmond under the command of Rear Admiral David Farragut, in an illustrious battle at Mobile Bay, Alabama — capturing this strategic Confederate stronghold. It is fitting that this panel is located at Hantsport School,which, like Mr. Jackson, is at the heart of the community. Windsor Plains includes Three and Five Mile Plains. The earliest settlers of African descent came to the Windsor Plains area as enslaved servants, prior to and during the era of the New England Planters (1760’s). After the American Revolution, some freed Black Loyalists and others enslaved by white Loyalists, landed in the area. Black Refugees of the War of 1812 arrived between 1814-1816 and began to assert their influence in the Windsor region. 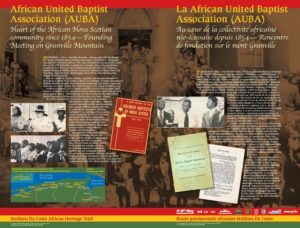 In 1854 this birthplace and founding site of the African United Baptist Association (AUBA), long considered the spiritual beacon and heart of the African Nova Scotian community, held its First Meeting. Throughout its’ distinguished history, this unique institution has met the social, cultural, educational, and spiritual needs of its member communities. The African United Baptist Association’s (AUBA) Womens’ Institute, Baptist Youth Fellowship and Mens’ Brotherhood continue to provide avenues for leadership development and community outreach. This panel showcases the impact of this organization since its founding to present day.